We had a choice of medal colors this year. I found my third Sea Wheeze to be just as enjoyable as the first two - Lululemon once again put on a very good race and race weekend. This race makes my seventh half marathon since my first Sea Wheeze two years ago. It was my slowest half marathon to date but I've been nursing a sesmoiditis injury since mid-July and wanted to be in okay shape to run the Disneyland half this weekend and the two other Disney races I have lined up in the next few months. My only goal for this race was to finish without re-injuring myself and get the bling. My trip to Vancouver this year was very similar to last year - I traveled by myself (out of Orange County's John Wayne airport this year instead of LAX) to meet up with my sister and her kids in Vancouver. We stayed at the same hotel as last year, the Fairmont Vancouver, located about four blocks away from the Convention Center/starting line. 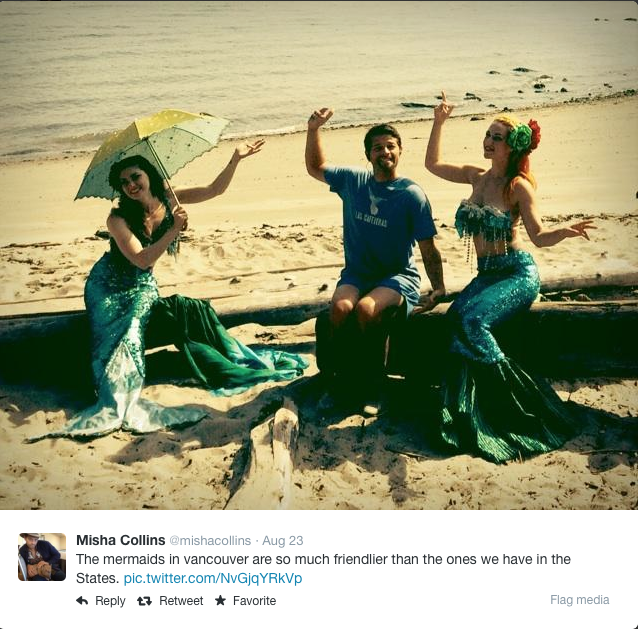 Misha Collins got a photo op with the Sea Wheeze mermaids. 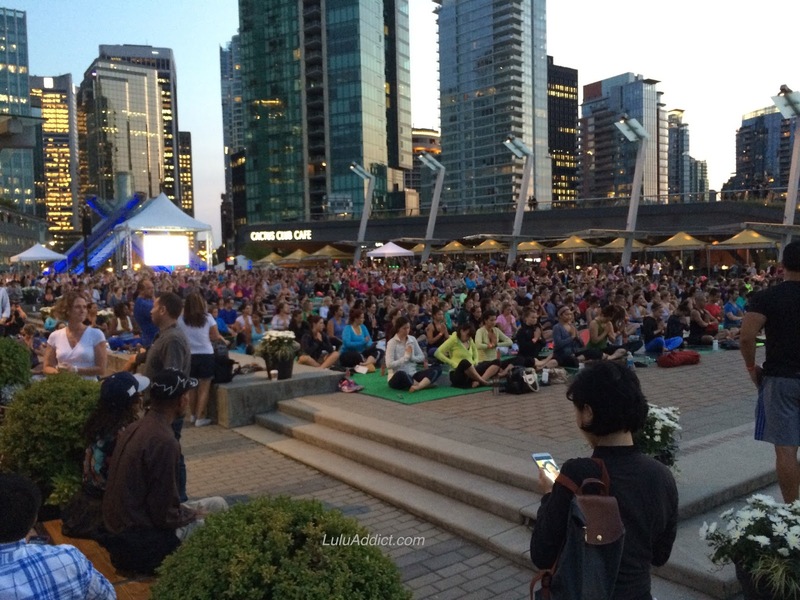 Unlike last year, our part of Vancouver was jam packed for the weekend. There were a couple of conventions in town, an anime one and one for the TV show Supernatural, plus the race so the line for customs to enter Canada was about three times as long as last year's. Though I traveled by myself I ended up picking up a couple of fellow Sea Wheezers (hi Connie and Chelsea) for each leg of my trip so I had company during my layover in Seattle, while waiting to get through customs, and taking the train into Vancouver. It's pretty easy to spot a fellow Sea Wheezer since we're outfitted in head to toe lululemon and usually sporting a lululemon gym bag as a carry on. It's an easy conversation starter. In Seattle, I read about the special edition bicycle shirts the Robson store was giving out/selling in honor of its grand opening. I figured I'd stop there on the way to the hotel since my room wouldn't be ready. Though customs took so long that I got into Vancouver after 2 pm, I did go straight to the Robson lululemon store, rollerbag and all, since it's right up the block from my hotel. 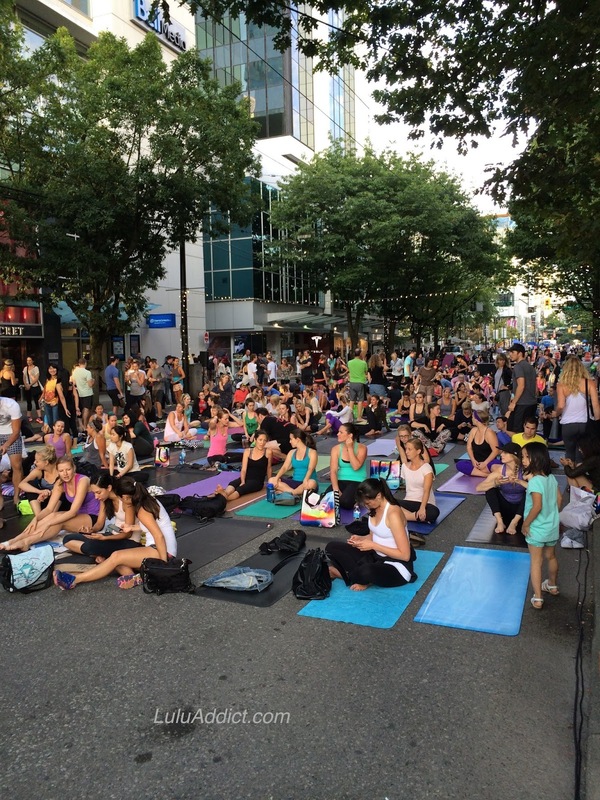 By the time I was done at Robson my sister had arrived in Vancouver. We had dinner at a place up the block recommended by Vancouver native Lulumum, did some shopping at the Robson store again, and went to bed early since we knew the lineup for the Expo would start before dawn. Pre-dawn Expo lineup, looking to the front of the line. This year there were two separate lines and physical locations for the store and packet pickup. Unlike last year, runners did not have priority entry over the public which has caused a bunch of grumbling on social media. It was changed because last year's runners who didn't want to shop complained about getting stuck in two hour long lines to pick up their packet. 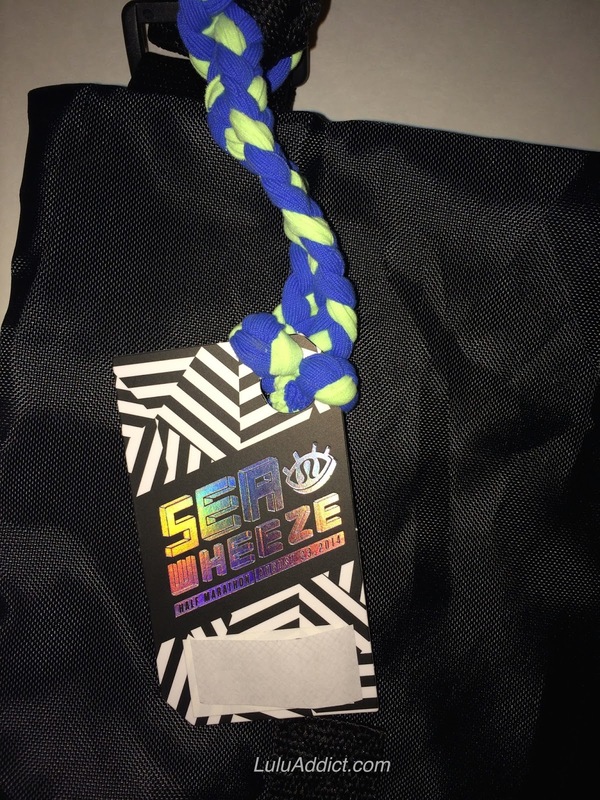 (The Sea Wheeze crowd is dominated by big fans of the brand so I find it hard to believe that the non-shopping people complaining about packet pickup lines were actually that numerous). 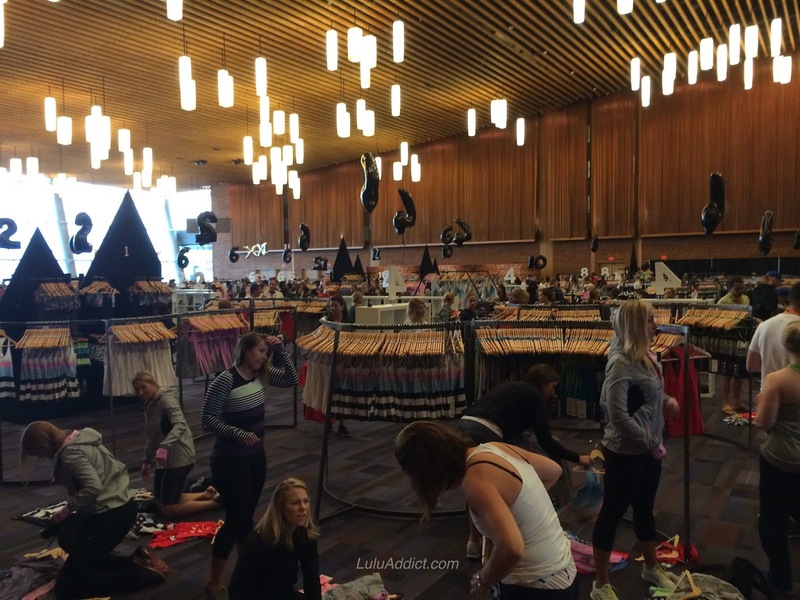 In my opinion, you should tell runners who don't want to shop to come after noon when there is no line but lululemon decided to go back to the way they had it the first year and let anyone into the store area. Our goal was to be in line early enough to be in the first wave of people let into the store, which we were. At some point some entertainment for the line arrived. 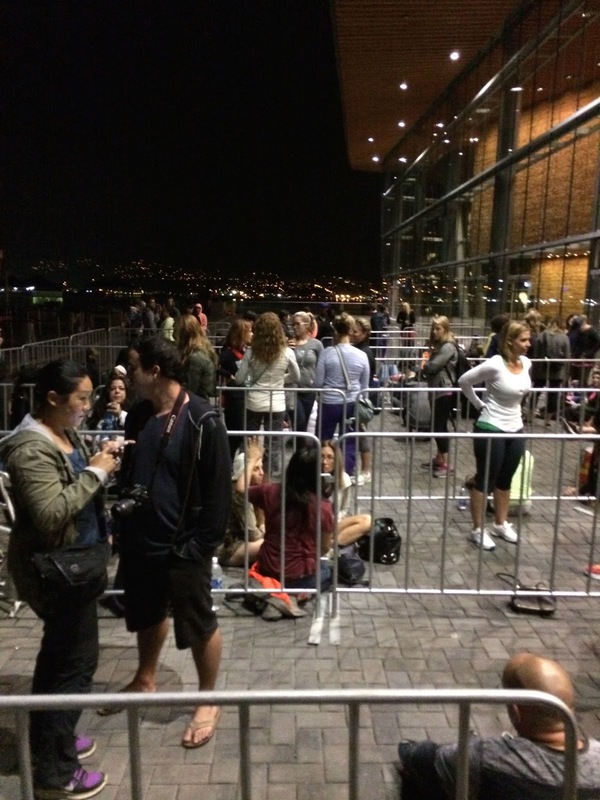 View looking towards the front of the line, prior to the 7 am opening. Our time in line went by very quickly, chatting with old friends - Lulumum met us - and making some new acquaintances (hello eds, Amy and Terry from North Carolina, Ms. S. and Ms. A.) and before we knew it it was 7 am and time to shop. The merchandise floor seemed more crowded this year. Looking towards the communal changing room. The merchandise areas seemed more crowded this year than last and I found shopping this year a bit more stressful than last, though not as crazy as the first year. I think there were a lot more racks of merchandise this year than last and perhaps more people were let in to shop. There was definitely a greater breadth of selection. 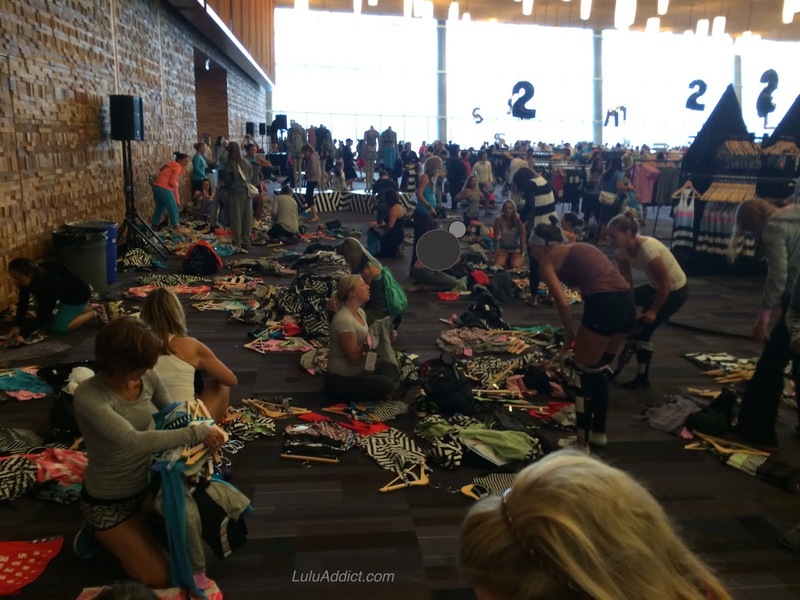 The standard technique for Expo shopping is go in, find your sizes, grab armfuls of the clothes you think you want then head to an open spot along the room margins to try it on/sort out what you want and whittle your pile down to 15 items. Workers would come along checking for rejects to be put back on the floor and other shoppers would also ask you if you were going to keep certain items. We took our time and I think we spent about three hours total in the store. (I will cover the specific merchandise in detail in a separate post.) 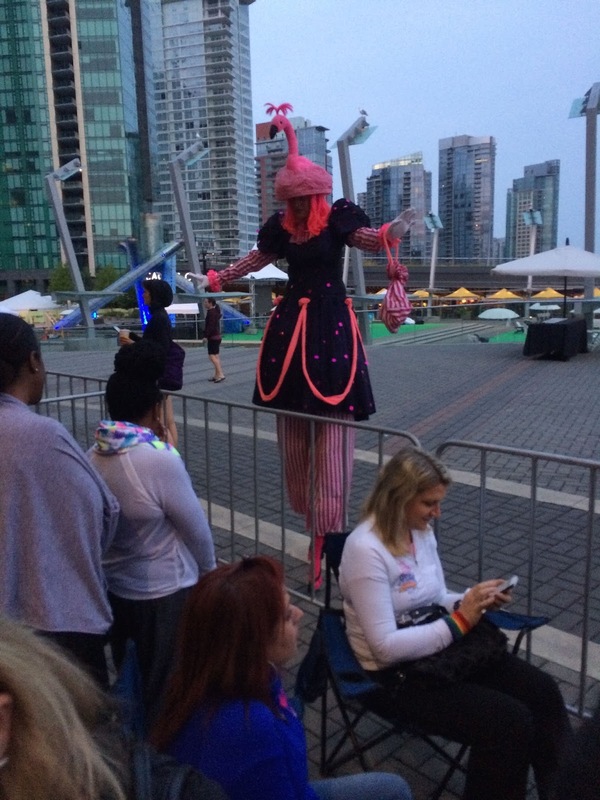 Honestly, in some ways I almost find the Expo the hardest part of Sea Wheeze weekend. If you find Black Friday-style shopping fun then the Expo will be no problem for you but I have to mentally gear up for it somewhat. In line to pick up our packets. Stuff sack and water bottle. Bag tag is attached with a headband. After we were done with the store we moved on to the packet pick up room which was around the corner from the Expo store. The line was on the long side but moved very fast so I think it took us about 10 minutes to get our packet. 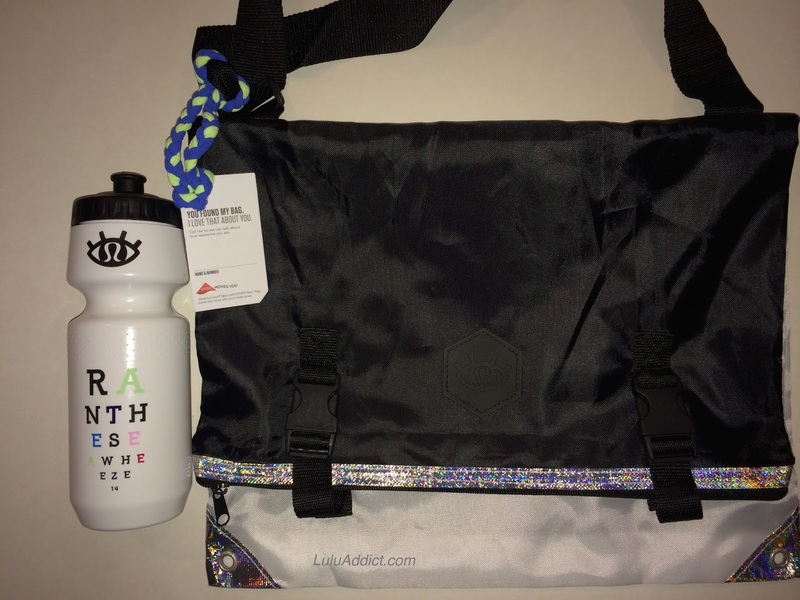 The packet was a neat messenger bag style stuff sack, a cute Sea Wheeze water bottle, wristband, and our Chip timing chip. 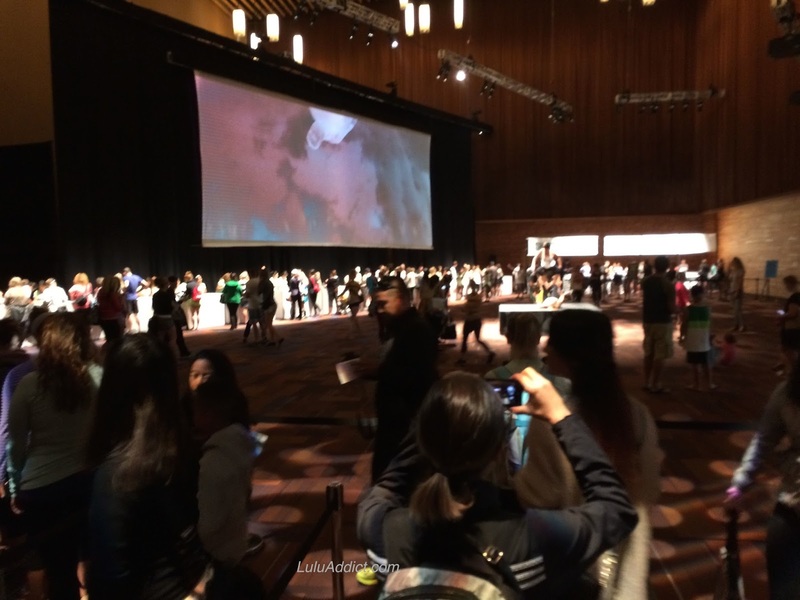 Though the outside plaza once again had stations for Sea Wheeze tattoos, organic cotton candy, hairstyles, and other freebies/perks we bypassed these to head back to the hotel to drop our stuff, grab a coffee, and relax for a little bit before lunch. We had lunch with a long time lululemon community member, Ms. A., who I "know" from my Facebook groups but had never met before and is the nicest lady. I look forward to meeting her again next year. We also took a trip back to the store to see what was left. There were a lot of size 2s left, more size 4 shorts than I would have thought, and a smattering of everything else. 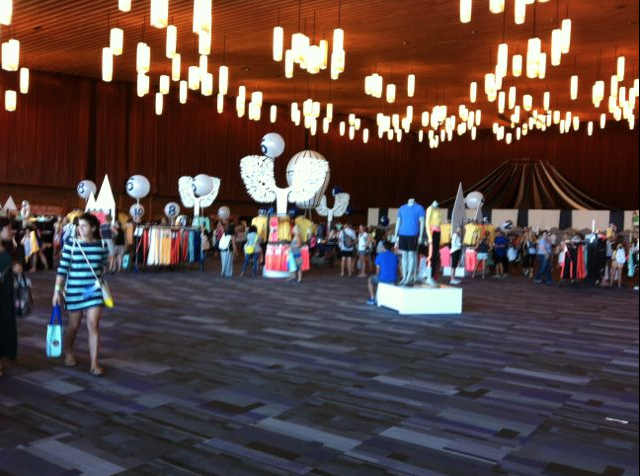 The Expo store did so well lululemon decided not to open it the next day. I know around 3 p.m. it was mostly size two stuff, a little size four, and some men's stuff. For those of you who went to the Expo, what did you think? For those repeat Sea Wheezers, what did you think of the shopping experience versus previous years? I was also in the first wave. 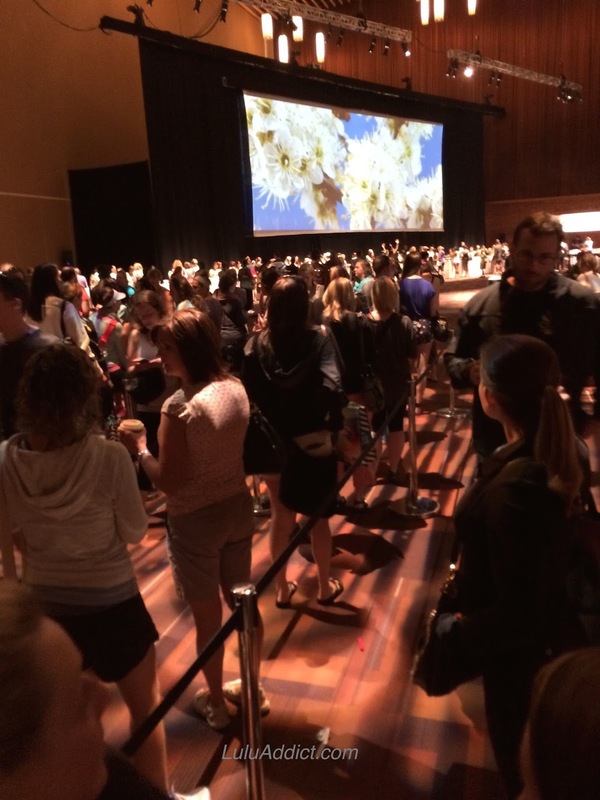 This was my first SeaWheeze and could not believe the craziness of the expo. I thought the Disney expo's were insane but this SO proved me wrong. People running to get inside? I posted a pic below of my stash. I wanted some sports bras. I put one back and then regretted it. They were gone fast. The store experience was pretty crazy, but also entertaining to see and experience. I lined up a little before 7:00 am. The line was pretty long, but moved quickly, plus there were really friendly people around us which made the time pass faster. When I got into the store the majority of items left on the racks and displays tables were smaller sizes, 2-6 only. I like to size up in most shorts, but took a gamble with a size 4 tracker short in the beautiful rainbow/prism looking print. Thank goodness they fit. I ended up finding all items I was hoping to the purchase just by being polite and asking people with huge piles if they were planning to purchase everything in their obviously 15+ mountain of clothing mess. I ended up with the geometric and black/white stripe vintage pink inspire crops, run stuff your bra in the rainbow print, rainbow print run singlet, and vintage pink black/white stripe CRB. I had a great time people watching while shopping. 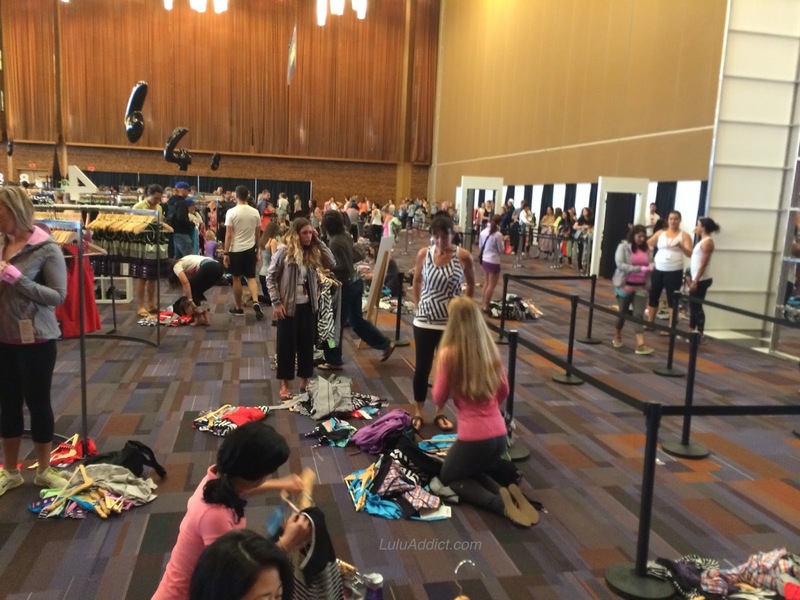 It was funny just to sit back and take it all in, from the obvious resellers who brought multiple family members to get around the 15 item limit to the ladies who used the expo floor as their personal changing room. 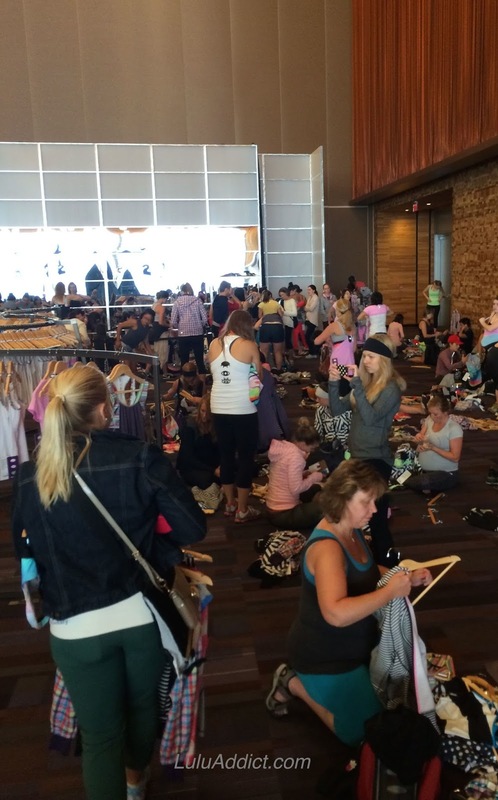 There were a couple grabby people who snatched up clothing aggressively, but for the most part everyone played nice. 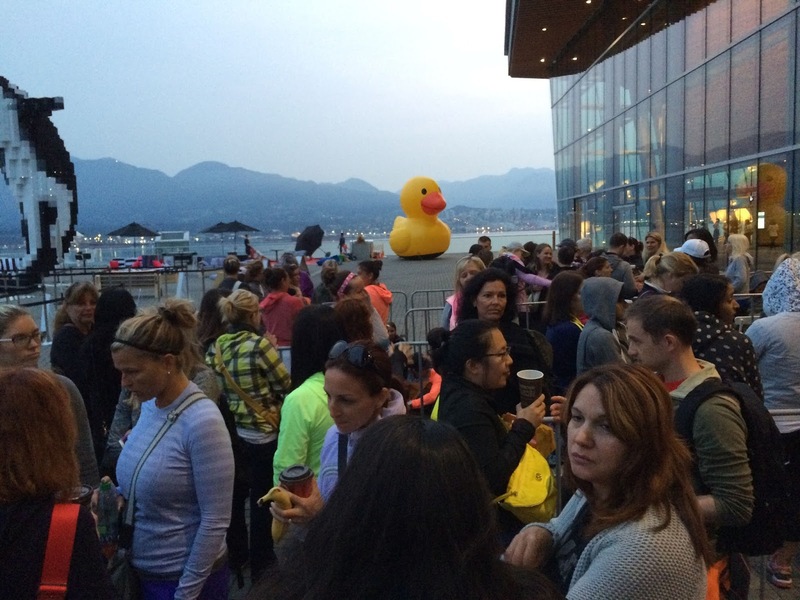 The packet pick up line moved quickly and the expo extras (spray on tattoo, yoga, food sample tables, etc.) were fun. The only change I'd recommend is the one you suggested, LLA regarding allowing race participants to have priority over the general public for store purchases. I was bummed about the Stuff Sack. The white part was stained by the black buckles. I heard from a volunteer that almost all the bags were like this. Afraid of using it in fears that I will get black stains on my clothes! Thanks for putting this together. It is a fun read and great to live vicariously! So--are you going next year? Can't believe signup is so soon. I really want to try and get a spot but it is a tough time of year for me as my kids start school that week (in Colorado). I might try to get a spot, and figure it all out later! I too think that racers should get priority over the public at the showcase store, maybe Seawheezers on Friday and public on Saturday to pick through what's left. I think that's only fair to runner traveling from all over. I stayed at Fairmont Vancouver also and the walk down was easy! Hi LLA! You were only a few people behind us in line. (I was in a yellow street to studio jacket). I found the experience a bit more chaotic than last year. By the time I had grabbed the tanks I wanted, the shorts were gone, maybe 10 min after 7am? My husband (aka neck brace guy), and my friend's husband stood by our stuff and while last year we were there for three hours, this year we were out in an hour. Due both to a conference call hubs needed to be on at 8:30 and that I picked up at least one of what I was looking for, and a few other goodies (the tuck and flows and the speed tights were a nice surprise!). Love that the pace rival was skirt of choice thus year, I love that style and ended up wearing it with the pink/black&white stripe tank and my Boston hat on race day. Was luck enough to snag a bag about two minutes before they were all gone. While I got what I wanted, many others didn't. When my friend got to the expo at 1, there was nothing left in 8, 10, 12. Very diff'rent from two years ago when the two of us got there at 12:30 and we're able to pick up some nice items (though not the most popular ones). I hope they have a runner-only time or allow for runner-only preorders next year. She was shut out of the shorts as well, and ended up with nothing from this years SW.
Wow, I was mesmerized by your recap LLA....and I'm not a racer. Great job! I was so excited by your pictures because I managed to spot my friend and I in a photo! We are in the 7th expo photo, so the one below where you wrote "looking towards the water." It is interesting that you found the merchandise area more crowded feeling this year. 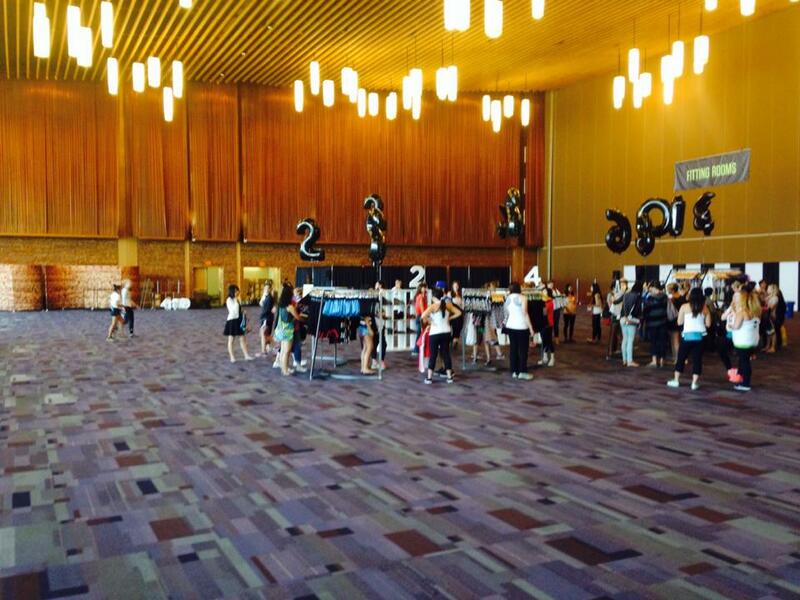 I actually thought it looked really empty compared to 2013 because the registration tent wasn't in there. They tended to not have as many shelves with cubbies for the shorts and there were only 2 platforms with mannequins compared to past years where there were several. The female mannequins quickly got dismantled for their clothing I noticed! Once people started amassing piles and lining up for the register the place seemed really crowded. The pay line was really chaotic seeming because it snaked all over the place. I like that they put discard racks in that area though because it gave people last minute chances to snag things they might not have seen out on the floor. I think the clothing choices this year were better than 2013 because they stuck to more core items it seemed. I really wish they had done more skirts, I totally would have bought one in the plaid if they had made that. They cut down on the number of duffel bags this year whereas last year they couldn't give them away it seemed. I liked that all the accessory stuff was all in one place. I know they have usually mixed it in with the clothes which made finding things a bit hard. The layout of rounders for a given size was a bit weird. I think a lot of folks go for size 4 and 6 but you had to go to opposite sides of the room for that. I kept going to the size 8 area because that is what seemed like the logical flow and placement of size 6 and I grabbed some of the wrong sized items until I figured that size 6 stuff was elsewhere. I went back to the store around 4:30pm and I couldn't believe they had so much size 4 stuff left! I talked to one worker and she said they based the sizing amounts on the registration shorts distribution. I felt bad for the men because their clothing choices were super limited this year. They had better choices in the previous years and I know some women bought some of the men's items that were a bit more unisex. 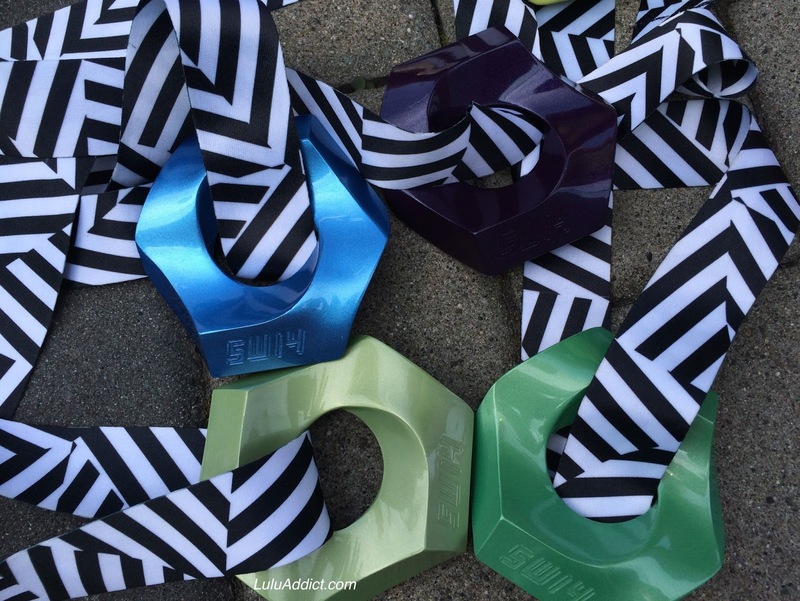 Absolutely a fabulous review of your weekend, luluaddict!!! Yay! So glad the recap is here! 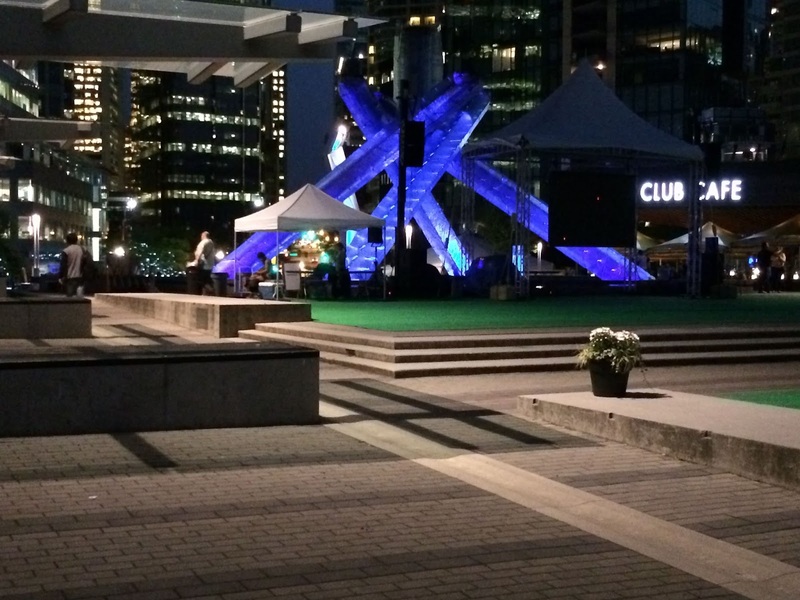 I thought that Vancouver seemed much busier in general this year. Not loving the later weekend, think it made for too many events going on in the city at once? Glad you enjoyed yourself all around! I can't say I miss this retail craziness (have been to SW in prior years). The only thing I miss is Vancouver, but fortunately am visiting again (and Van Island) in September. That's a very cool medal! Sort of a cross between Vancouver and Tofino's olympic medals. Nice kit bag they gave you too. Thanks for posting! I was there, a little behind you in the Expo line. I love your recap. I am also so grateful that you didn't get a photo of my taking off my crops to try on the Speed tights. ;-) Thank goodness for the length of the tuck and flow to maintain some modesty. This was a great experience. I've run Disney 6 times and this was every bit as good (except for my first Disney, because: first!). If I caught you in your underwear I would have bubbled you out. :) If you look closely in one of the photos I posted I have gray bubbles over one woman who was in her bra. I actually took a photo of my sister in her sports bra and crops, which I didn't discover until later, but since she was on the margin she was cropped out.